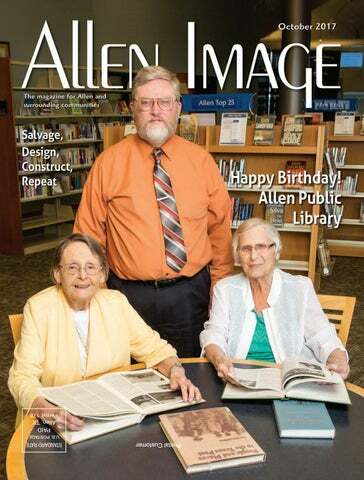 With a well-deserved reputation for innovation, education and entertainment, the award-winning Allen Public Library owes its humble beginnings fifty years ago to a group of indomitable women. to really listening and understanding their patients’ needs, giving thorough explanations about the treatments they recommend, and creating a comfortable dental experience for the entire family. Both doctors also bring an exceptional level of experience and expertise to their practice. Dr. TorrensParker received her Doctor of Dental Surgery degree from La Universidad de Zulia in Maracaibo in 2002, completed extensive training in Prosthodontics (which includes mouth rehabilitation, crowns, veneers, bridges, implant restoration and oral appliances), and earned her Master of Science degree from Columbia University in 2007. Committed to providing her patients with the best and most effective care, Dr. Torrens-Parker stays up-to-date on continuing education and cuttingedge technology. Dr. Lizardi obtained her Doctor of Dental Surgery from the College of Dentistry at the University of Illinois in Chicago in 2007, as well as from the University of San Tomas de Aquino in Columbia in 1994, and has been practicing dentistry since 1995. The doctors bring their combined experience of thirty-five years to the Allen community. Allen Family Dental provides professional and friendly dental care for the whole family, from children to their parents and grandparents. “I love the relationships I’ve built with my patients. I trust them, and they trust me in return. That longevity—seeing patients through the years—is what we’re all about.” Call to schedule an appointment. Allen Image © 2017 by Moonlight Graphics. All rights reserved. Allen Image is published by Moonlight Graphics and individually mailed free of charge to the residents of the Allen area. Subscriptions are available to residents outside the delivery area at a rate of $2.50 per issue—$30 per year. 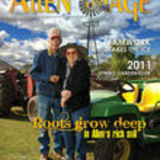 Allen Image, P.O. Box 132, Allen, TX 75013, 972.727.4569, fax 972.396.0807, visit our website at www. allenimage.com or email us at contact@allenimage.com. added to concession stands along with a new touchscreen point-of-sale system for food and beverages. It might be too early for a chorus of “Auld Lang Syne,” but the City of Allen is already turning the page on another fiscal year. The 2016-2017 budget year ended on September 30, capping off twelve months of incredible growth and impressive accolades. Here’s how Allen is building better together. crew began protecting the sewer system from costly leaks and overflows by enforcing rules about fat, oil and grease collection in Allen’s 200+ restaurants. Smoother streets now pave parts of the Central Business District and 140 new school zone signs remind drivers of updated school hours. By administering the Community Development Block Grant, city employees connected more than 100 families with federal funding to help prevent homelessness and preserve Allen’s older neighborhoods. And hundreds of residents pitched in to keep Allen beautiful, collecting 131 tons of litter and recyclables during annual cleanup events planned by city staff. These efforts didn’t go unnoticed. Dallas Morning News named Allen the second-best neighborhood in North Texas in its annual “Best of DFW” rankings. Finance and real estate websites included the city in lists of best places to buy your first (or your “forever”) home. Allen Public Library earned a state award for library excellence—one of only 43 libraries in Texas with this honor. And Keep Texas Beautiful recognized the city’s Community Services staff for helping residents conserve water, pick up litter, plant trees and keep chemicals out of the water system. visit the CCMGA website: ccmgatx. org, or call 972.548.4232. v Dawn Bluemel Oldfield is the CCMGA Public Relations Chairperson. The annual Creekwood Fall Festival will be held Saturday, October 21, 3-6 p.m., at Creekwood United Methodist Church, 261 Country Club Road, Allen (corner of Stacy and Country Club). Admission is free and attendees will be treated to a petting zoo, hay rides, face painting, carnival games, cake walks, a bounce house, balloon animals, hotdogs, popcorn and much more! Sunday, October 29, marks the 500th anniversary of the Reformation. What better way to celebrate than with an organ and brass concert featuring one of the top brass ensembles in North Texas! Friends and families will have the opportunity to pose for portraits at the big red Creekwood barn, believed to be one of the oldest standing barns in Collin County. Take a picture by the barn and post it to social media with #creekwoodpatch. For each posting, Creekwood will donate $10 to the Ten Buys a Hen campaign benefitting the Assistance Center of Collin County providing a holiday turkey for a local family in need. The patch will be stocked with over seven tons of pumpkins, available for purchase, with proceeds benefitting Creekwood youth mission work. Beginning Sunday, October 1, the patch will be open daily from 9 a.m. to dusk. Tickets on sale now through Ticketmaster (www.ticketmaster. com), charge by phone at 800.745.3000 or at the Allen Event Center box office. For more information, visit www. alleneventcenter.com. 14	Plano International Festival at Haggard Park, 901 E. 15th St., Plano, 11 am-5 pm. The area’s largest cultural event offers food, fun and entertainment for the whole family. Multicultural music, dance performances, ethnic food trucks and cultural displays. Hands-on children’s activities, foreign film screening, flag parade and the only outdoor naturalization ceremony. Fitness and Wellness Fair, 10 am-1 pm. Free health screenings and flu shots. Admission and parking are free. For more info: planointernationalfestival.org. 28	Allen Eagle Home Run Club Golf Tournament, Twin Creeks Golf Club, 501 Twin Creeks Drive, Allen. Join us for 18 holes of golf followed by a dinner, silent auction, raffles and door prizes. Check-in is at 12:30 pm, and shotgun start is at 1:30 pm. Fees are $110 per person or $400 for a foursome; dinner and silent auction only is $20. For more information or the register online, go to www. alleneaglebaseballhrc.com. Tournament scoring will follow a Stableford format and will be flighted based on team handicap. Register online at WattersCreekGolf.com. All ages welcome. 13	SNAP Dance, Allen Senior Recreation Center, 7-10 pm, ages 18+. Special Needs and Adapted Program! Enjoy music, a fun theme and snacks. This month’s theme is Halloween! For info, contact Ryan Patterson at rmpatterson@cityofallen.org or 214.509.4753. Cost: $10 Pre-registration/$15 at 5 pm on Wednesday prior to dance. For more information about Parks and Recreation events, visit AllenParks.org. 14-15 Family Night: Campout & Movie at Bethany Lakes Park (Joe Farmer Rec Center), 3 pm-9 am, all ages. Free for 2 years and under/$10 per person/$60 family cap. Camp out under the stars and enjoy some quality family fun! Fee will include access to crafts/games, pumpkin carving and more! At dusk, participants can enjoy a movie in the amphitheater followed by our traditional night hike. 6, 13, 20 & 27 Pumpkin Derby Workshop at The Edge (Computer Room). Need help building your Derby Racer? TEVC will be offering free workshops to help install axles on your Derby Racer. Derby Kits will be on sale for $10 and include all hardware and wheels needed. (Pumpkins not provided.) 5-7 pm, ages 6-18. Cost: Free. 20	Halloween Bash at the Nat—Don Rodenbaugh Natatorium, 8:30-11 pm, ages 17+. $10 per person/$15 couples. Join us for a night of spooky fun. We’ll be hosting a Halloween costume contest followed by a screening of The Rocky Horror Picture Show! Prizes will be given to the best male and female costumes. We’re staying open late for this unique Halloween experience. Community Garage Sale at Joe Farmer Recreation Center (Parking Lot). Make some extra money selling items you were thinking of throwing away! Become a vendor—each space is 17’x10’ and vendors must provide their own tables and chairs. Browsing is free to the public. 7 am-noon ages 17+. 1 space-$20; 2 spaces-$35; 3 spaces-$50. 7-8	Dawson Private Wealth Collin County Tournament of Champions at The Courses at Watters Creek, 7:30 am tee times on Saturday and Sunday. Two-person team golf tournament for players of all skill levels. At least one player per team must reside in Collin County. 28	Arbor Day Celebration at Twin Creeks Park, 9 a.m. to noon, all ages, free. Join Allen Parks and Recreation for our annual Arbor Day Celebration. Arbor Day is a nationally-celebrated observance that encourages tree planting and care. Tree plantings and educational arts and crafts are part of the celebration activities. 28	Halloween Skate at Allen Community Ice Rink, 11:45 am to 1:45 pm, all ages. $5 entry/$3 skate rental. Get in the spirit of Halloween at Halloween Skate. There will be candy, raffles and much more. All on-ice participants must wear skates. Those who dress up in their costumes will receive a free skate rental. 28	Pumpkin Derby at The Edge, noon-2:45 pm, ages 5-17. Cost: $10. This is a fun-spirited event with side-by-side races featuring handcrafted, decorated Pumpkin Racers in a display of American ingenuity. Excitement builds as Derby Racers battle head-to-head. Awards will also be given for Best Design. 28	Howl-O-Ween Barkin’ Bash at Bethany Lakes Park (Joe Farmer Rec Center), 1-3 pm, all ages, free. Dress up your dog and join the fun at Howl-O-Ween Barkin’ Bash! Contests, dog demonstrations, games, raffles and more! It’s going to be a HOWL of a good time! Interested in sponsoring? Call 214.509.4750. ALLEN PUBLIC LIBRARY Celebrating 50 years! YOUTH SERVICES Story Times are held in the Children’s Program Room. All story times are free and no registration is required to attend. For more information, call 214.509.4906. Baby and Me, for pre-walkers with caregiver, Wednesdays at 10:15 am. Fun Ones & Twos, for 1 & 2 year-olds with caregiver, Mondays, Tuesdays & Thursdays at 10:15 am. Together Time, for 3-5 year-olds with caregiver, Mondays, Tuesdays & Thursdays at 11:15 am. All By Myself, for 4-5 year-olds without caregiver, Wednesdays at 11:15 am. Pajama Time, for 3-5 year-olds with caregiver, Tuesdays at 6:30 pm. Music and Movement, 10:30-11 am, ages 2 & up with caregivers. We sing, dance, and make music! Limited to 80. Free tickets will be available 30 minutes before the start of each story time at the Children’s Desk. Bilingual Mandarin English Story Time, 10:30-11 am & 11-11:30 am. Enjoy a bilingual story time in Mandarin Chinese and English with stories, rhymes and songs. Limit 100 participants. Free tickets available 30 minutes before the start of each story time at the Children’s Desk. Spooky STEM Science, 3-4 pm, ages 8-12. Get ready for Halloween with spooky science experiments! 18	Make It & Take It, 4:30-5:30 pm, ages 8-12. Join us each month for a new and awesome craft project! This month: make your own fidget spinner! 18	Ladies Night Out Book Club, 7-8 pm. Come join us in a discussion of In a Dark, Dark Wood by Ruth Ware. Free; no registration. 19	Explore Horizons Homeschool Workshop, Flat Stanley, 1:30-2:30 pm, recommended for ages 5-8, but all ages welcome. Explore storytelling and writing with this classic tale from Jeff Brown. Pre-registration required to attend. To register your family, call the Youth Services Desk at 214.509.4906. 24	Learn to Knit, 10:30 am–noon. Learn the basics of knitting. Learn how to cast on, bind off and the knit stitch. Supplies are limited. For best selection, please bring a pair of bamboo needles (size 10 or 10.5) and a skein of worsted weight yarn. 20	Sensory Play Day, 10:30-11:30 am, ages 0-3 with caregivers. Join us for a relaxed morning of stimulating sensory play stations. 21	Lego Family Fun Day, 10:30-11:30 am, ages 5 & up with their families. Build STEM skills and create with LEGO at the library! This month’s theme: mad science! Children under the age of 9 must be accompanied by an adult. 23	Build It: Snap Circuits, 3-4 pm, ages 7-12. Join us every other month for this program where we test our building, coding, and other skills. 25	Princess in Black Party, 4:30-5:30 pm, ages 5 & up with families. Come be an amazing, monster-fighting princess with us! Crafts, games, and fun! 27	Halloween Story Time, 10:30-11:15 am & 11:30am12:15 pm, ages 2 & up with families in the auditorium. Enjoy a Halloween themed story time and show off your costume! Free tickets available 30 minutes before the start of each story time at the Children’s Desk. 28	Family Game Day, 10:30-11:30 am, all ages. Have fun playing games with friends and family while gaining problem-solving skills and increasing your creativity. Games for all ages from pre-readers to adults. All games are provided. Children under age 9 must be accompanied by an adult. TEENS (AGES 12-18) For more information about any of the events below, call 214.509.4906. All events are free and no pre-registration is required to attend. Ages listed are firm. 12	Anime Evening, 6:30-8 pm, in the Upstairs Program Room. Come enjoy an evening of anime, Japanese snacks and crafts! Noontime Pageturners Book Club, The Dollhouse by Fiona Davis,12-1 pm. Join us for a lively discussion! We offer a relaxed environment where you can share the joy of reading. New members welcome. Trivia Night @ Nine Band Brewing Co., 6-8 pm, off-site at Nine Band Brewing Co., 9 Prestige Circle, Allen. Ages 21+. Team up with your friends to test your knowledge of beer, literature, history, science and more! Keep teams to six or fewer members. The tap room has draft beer for purchase; the library will not provide alcohol. 11	Twisted Threads—A Fiber Craft Circle, 6:308:30 pm. This is a social group for knitters, crocheters, cross-stitchers, quilters and any crafters who use thread or yarn! All skill levels welcome! Work on your latest project in the company of other crafters. Ages 18+; no childcare provided. 17	Nonfiction Book Buzz!, 7-8 pm. The Let’s Talk Dewey Nonfiction Book Club welcomes Penguin Random House rep Robert Haddock as he shares new and forthcoming nonfiction books. He’ll bring advanced reader copies and “Keep Calm and Read On” tote bags for attendees. No pre-reading necessary; all welcome! 18	DIY@APL-Handmade Greeting Cards, 10-11:30 am. Make your own personalized greeting cards using scrapbook paper, buttons, washi tape and more. It’s fun and easy! All supplies will be provided. Ages 16+. 2ChangeU Toastmasters, meets every Tuesday, 7 pm, Plano Family YMCA, 3300 McDermott Rd., Plano. Visitors welcome. For more info: www.2changeu.org. Allen Area Patriots, meets the 4th Thursday each month, 7-8:45 pm, Allen Municipal Building, 301 Century Pkwy. Allen. Local Tea Party presents speakers, encourages citizens to participate. For more info: www.AllenAreaPatriots.com. Allen Garden Club, meets the first Thursday each month, 7 pm, gardening talks by area experts, Allen Heritage Center, 100 E. Main. For more info: Denise Webre, 972.390.8536 or www. allengardenclub.org. Allen Heritage Guild, meets first Wednesday each month, 6:30 pm, Allen Heritage Center, 100 E. Main. Programs feature guest speakers on topics of historical significance. For more info: 972.740.8017 or www.allenheritageguild.org. ALLen Reads meets the 2nd Monday each month, Board Room, Allen Public Library, 300 N. Allen Dr. For more info, www.allenfriends.org. Allen Retired Educators meet the third Monday each month, 10:30 am, Heritage Ranch Country Club, 465 Scenic Ranch Circle, Fairview. RSVP: Sondra Long, billysondralong@tx.rr.com. Allen Toastmasters’ Club, meets every Monday, 6:30 pm, Train Depot, 100 E. Main, Allen. Guests welcome. For more info: Joe Nave at 214.566.3100. American Association of University Women-Plano/Collin County Branch, meets 2nd Monday each month, 6:45 pm, 2nd Floor Conservatory, Senior Living Center, 6401 Ohio Dr., Plano. Open to anyone with assoc. or bachelors degree interested in helping women. For more info: Carol, 972.862.3460. Art History Brown Bag Series, meets first Wednesday each month, 12:30-1:30 pm, Heard-Craig Carriage House, 205 W. Hunt St., McKinney. Lectures by Annie Royer. Bring lunch. For more info: 972.569.6909 or www.heardcraig.org. Bible Study, meets every Thursday, 9:30-11:30 am, Community North Baptist Church, 2500 Community Avenue, McKinney. Bible study for women and children. Studying Luke. Reg. req. For more info: katpf@att.nett or mckinneyallen.cbsclass.org. Collin County Aggie Moms, meets 3rd Monday each month, 7 pm, Texas A&M Ext. Center, 17360 Coit Road. For more info: 972.382.3124 or www.collincountymoms. aggienetwork.com. Collin County Archaeology Society, meets second Tuesday each month, 7 pm, Texas Star Bank, McKinney. For more info: archaeology@netzero.net. Collin County Genealogical Society, meets the second Wednesday each month, 7 pm, Haggard Library, 2501 Coit Rd, Plano. For more info: ccgs.programs@gmail.com. Collin County Libertarian Party meets second Wednesday each month, at 5th Street Pizza, 111 Central Expwy., Allen. For more info: collinlp.org or email collinlp.org@gmail.com. Collin County Master Gardeneers tour of Myers Park, meets first Wednesday each month, 10 am, 7117 County Rd. 166, McKinney. Reservations required. For more info: 972.548.4232 or mgcollin@ag.tamu.edu. Collin County Republican Men’s Club, meets the third Thursday each month, 7 pm, locations vary. For more info: www.ccrmc.org. Dallas Dog Lovers, events for dogs and owners in the Dallas area. For more info: www.dallasdoglovers.com Department 56 Village Collectors Club meets second Saturday each month in Plano/North Dallas to share ideas. For more info: www.bigd56ers.com. Ericsson Village Toastmasters Club, meets every Monday, 12-1 pm, Ericsson, 6300 Legacy, Plano. Guests welcome. For more info: Per Treven, 972.583.8273 or per.treven@ericsson.com. First Nighter African Violet Society, meets the third Monday each month, 7-9 pm, Collin Higher Education Center, 3452 Spur 399, McKinney. Promotes interest in African violets and study of growth habits. For more info: 972.398.3478. Friends of the Allen Public Library meets third Wednesday each month, Board Room, Allen Public Library, 300 N. Allen Dr. For more info, www.allenfriends.org. Gaslighters Book Review Club meets the third Wednesday every month September thru May at the Heard Craig House, 205 W. Hunt Street, McKinney, refreshments at noon, speaker at 1 pm. For more info: LaRue Whatley, 423.585.4983. Greater Collin County Kennel Club, meets third Wednesday each month, 7:30 pm, Joe Farmer Rec Center, 1201 E. Bethany, Allen. For more info: www.greatercollinkc.org. Legacy 4-H Club (Allen & Lucas), meets first and third Tuesday each month, 7 pm, Lovejoy High School, Lucas. For more info: kathrin_esposito@asus.com or 214.616.2460. Lone Star Parliamentary Unit, meets 2nd Monday of each month September thru May 10:30 am, Allen Public Library. Promotes parliamentary education. For more info: 972.727.3090, Mae Shaw, Pres. Lovejoy Preschool PTA. Monthly meetings at Creekwood UMC, 2nd Thursday each month, 261 Country Club Rd, Fairview. Different topic & speakers. Free lunch; babysitting available for nominal fee. For more info: www.lovejoypa.org, meetup.com/Lovejoy-PreschoolPTA/. McKinney Amateur Radio Club, meets second Tuesday each month, 7 pm, Spring Creek Bar B Que 1993 North Central Expressway, McKinney. For more information: 972.814.4190. McKinney Area Newcomers’ Club, meets third Tuesday each month, 9:30 am, social; 10 am meeting, Trinity Presbyterian Church, 5871 W. Virginia Pkwy., McKinney. October program: Rick Wells, owner of Rick’s Chop House and Harvest. For more info: www.mckinneynewcomers.com. McKinney Area Republican Co-Ed Club, meets second Thursday each month, 7 pm, Collin County GOP Hdqts., 8416 Stacey Rd., #100, McKinney. Location varies. For more info: collincountyconservativerepublicans.com. Moms in Prayer, join worldwide prayer movement—bringing mothers together and seeing God change children through prayer. For more info: MomsInPrayer.org or Amy Guthrie at amyguthrie@ verizon.net..
NARFE Chapter 559, meets third Monday each month, 1:30 pm, Village of Stonebridge Assisted Living, 3300 S. Stonebridge Drive, McKinney. All current government employees and retirees invited. Nar-Anon Family Group, meets every Wednesday, 7:308:30 pm, at Good Shepherd United Methodist Church, 750 W. Lucas Road, Lucas. Fellowship for those affected by someone else’s addiction. For more info: Jerry or Carla, 972.837.6558 or pony100k@icloud. com. Newcomer Friends of Greater Plano, meets second Tuesday each month, SMU in Plano, 5228 Tennyson Pkwy, Plano. All are welcome to join. October program: Brittany Underwood, founder and CEO of the non-profit Akola World Project. For more info: www.newcomerfriends.org. North Dallas Newcomers, meets first Thursday each month, 11 am, various country clubs. For more info: www.northdallasnewcomers.net. Open Forum, meaningful discussions, meets first Saturday every month, 3 pm, Delaney’s Pub, 6150 W. Eldorado Pkwy., McKinney. For more info: Charlie, 214.585.0004. Plano Amateur Radio Klub, meets the third Monday each month, 7 pm, FUMC of Plano, 3160 E. Spring Creek Pkwy., Plano, all welcome. For more info: www.K5PRK.net. Plano Photography Club, meets the 3rd Thursday each month, 7 pm, W. Plano Presbyterian Church, 2709 Custer Rd., Plano. Visitors welcome. For more info: www.planophotographyclub.com. Plano Republican Women’s Club, meets 3rd Tuesday each month, 11:30 am, Southfork Hotel, 1600 N. Central Expy., Plano. For more info: www.planorepublicanwomen.com. Prelude Clubhouse, a community center for adults living with a mental illness meets at Vintage Church on E. Lamar Street, McKinney. Open Tuesdays & Thursdays, 10 am-4 pm. For more information, please call 469.301.6639 or www. preludeclubhouse.org. Reasonable Faith Collin County Chapter, meets 2nd and 4th Thursday, 6:45-8:30 pm, Cottonwood Creek Church, Rm B202. For more info: www.RFCCTX.org and email: ReasonableFaithCollinCO@gmail.com. United Methodist Women’s Reading Group, meets 1st Sunday each month, 2 pm, FUMC, 601 S. Greenville. Book discussion & refreshments. We encourage women of all faiths to participate. For more info: http://www.fumcallen.org. Preston Persuaders Toastmasters, meets every Monday, 7:15 pm, Champions School of Real Estate in the Rangers Room at 3721 Mapleshade Ln, Plano. For more info: Ed Meissner, 469.323.0538 or Todd Richardson, 214.497.4495 or www.prestonpersuaders.org. Single Side Up, meets the third Saturday each month, 7 pm, This Side Up Family Center, 1100 Capital Ave., Plano. Single parent support group. Low cost childcare. For more info: www.singlesideup.org or info@thissideupfamily.org. Volunteer Master Gardeners offer landscaping and gardening advice, every Tuesday and Thursday, 9 am-4 pm. Texas A&M’s Co-op Extension, 825 N. McDonald #150, McKinney. For more info: 972.548.4232 or 972.424.1460. Texas Nationalist Movement-Collin County Chapter, meets 1st Tuesday each month, 6:30 pm at Scotty P’s restaurant in Allen, 109 Central Expy N #501, Allen. If you love Texas and value our independent spirit, come join us! Voyagers Social Club of McKinney, meets 4th Thursday each month, 10 am, Eldorado Country Club, 2604 Country Club, McKinney. Social club open to women in McKinney and surrounding areas. For more info: voyagersofmckinney@gmail.com. Random Events Dallas, laid back, fun, diverse social group with meetups in Dallas area. For more info: RandomEventsDallas.com. Reasonable Faith Discussion Group, meets every Tuesday, 11am-12:30 pm, Cottonwood Creek Church Rm B1116. For more info: www.RFCCTX.org..
Toastmasters SpeakUp Allen, meets every Wednesday, “Become the Speaker and Leader You Can Be,” 7 pm, IHOP, 315 Central Expwy, Allen. For more info: Bill Peterson, 972.523.9425. ART/MUSIC/THEATRE Allen Folk Music Society, meets 3rd Saturday each month, 7-10 pm, The Blue House, 102 S. Allen Dr. Bring snacks to share. For more info: www.twiceasfar.com. Allen Symphony Chorus rehearsals, every Monday, 7-9 pm, choir room at First UMC. For more info: Henry@WealthManagementGroupLLC.com. CRAFTS Allen Quilters’ Guild, meets the third Thursday each month, 7 pm, 1st Presbyterian Church, 605 S. Greenville. For more info: www.allenquilters.org. Common Threads of Allen, meets 1st and 3rd Tuesdays each month, 7 pm, Whole Foods Market Café, Stacy Rd. Share needle-work projects, learn techniques, etc. For more info: contact Debi Maige at 214.704.0994 or debik@ verizon.net. HEALTH Allen AA meets every Monday-Sunday, 601 S. Greenville. Mon.-Fri., 7 pm; Sat., 9 am; Sun., 7:30 pm. For more info: Joe, 214.564.9403 & Tina, 214.566.7561. Allen-Frisco-Plano Autism Spectrum Parents Group meets third Tuesday each month. Offers support and resources for parents of children with autism and other related developmental disabilities. Join online group at http://health. groups.yahoo.com/group/autismparentsupport. Allen Serenity Al-Anon Family Group, meets every Tuesday and Thursday, 7 pm, 1st UMC, Wesley House, 601 S. Greenville. For friends and family of alcoholics. More info: 214.363.0461 or www.al-anon.alateen.org. American Cancer Society Road to Recovery needs volunteers to drive cancer patients to appts. If you have a car and have time 9 am-5 pm, you can help. For more info: Debbie Moen, 972.712.5711. Baylor Health Care System support groups, medical info and events. For more info: www.BaylorHealth.com. Cancer Support Ministry, meets second Sunday each month, 4 pm, 1st Baptist Church Allen, 201 E. McDermott, Rm E101. For more info: Jimmy Smith, 972.727.8241. Heart Link Women’s Networking group, women only business networking. Monthly meetings. Days and locations vary. For more info: www.75013.theheartlinknetwork.com. National Alliance of Mental Illness Collin County Support Groups meet every Thursday evening, 6:30-8 pm at Custer Road United Methodist Church in the basement, 6601 Custer Road, Plano. There is one support group for persons with a mental illness and another group further down the hall for friends and/or family. Take Off Pounds Sensibly, meets every Tuesday, 6:15-8 pm, Good Shepherd UMC, 750 W. Lucas Road, Lucas. For more info: 1.800.YEA.TOPS or www.tops.org. Texas Health Presbyterian, variety of events. For more info: www.texashealth.org. The Shores AA Group, every Monday-Friday, noon, Raceway Prof. Bldg., 200 W. Boyd, Suite C, Allen. Open AA discussion group. All welcome. For more info: 469.854.9593. Weight Watchers, meets every Thursday, 12:15 and 6 pm, 1st United Methodist Church, 600 S. Greenville Ave., Allen. South entrance, 2nd floor. HOBBIES SPORTS/FITNESS Allen Classic Cars, meets every Thursday, 7-10 pm, 103-111 N. Central, parking lot of Stacy Furniture. The Experiment Aircraft Association, Chapter 1246, meets first Saturday each month, McKinney National Airport. Everyone interested in aviation is invited. For times and directions: eaa1246.org. Fit and Funky Fit Club, meets every Monday, 7:30 pm, & every Sunday, 7 pm, Unlimited Success Martial Arts, 604 W. Bethany #208, Allen. Work out to p90x, Insanity, etc. Free. For more info: fitandfunky@att.net. Infinity Personal Fitness Charity Workout, meets every other Saturday at 9 am, 1201 W. McDermott, Suite 106, Allen. Min. donation $5. Proceeds donated to local charities. For more info: email cattaneo.ray@gmail.com. McKinney Chess on the Square, meets every Wednesday, 4-7 pm, Downtown McKinney Performing Arts Center. Open play & lessons. For more info, 214.620.0527 or mckinneychess.org. McKinney Chess Club, every Saturday, 10:30 am-1:30 pm, McKinney Public Library, 101 E Hunt St. Free. And every Friday, 2-5 pm, Senior Center, 1400 South College Street, McKinney. Adults 50+(Free). For more info: 972.547.7491. Plano Bicycle Association, club rides, social activities, monthly meetings, newsletters. For more info: Chris Mathews, 972.964.2869 or www. planobicycle.org. Plano Pacers run at Schimelpfenig Library parking lot, second Tuesday each month, 5024 Custer, Plano, 7 pm., and at Bob Woodruff Park on San Gabriel Rd., Plano, the last Saturday every month, 8 am. For more info: Bob Wilmot, 972.678.2244 or www.planopacers. org. Skilled Motorcycle Riders Association promotes motorcycle safety through rider training. Monthly practice courses, social activities, etc. For more info: www.skilledmotorcycleriderassociation.com. Stroller Strides Classes. For class information, check out Fairview.fit4mom.com. First class Free, email Lolo@fit4mom.com. For more info: Fairview.fit4mom.com. Zumba/Cardio Dance Fitness, every Tues., 10:30-11:30 am, and every Thurs., 9:30-10:30 am, USA Martial Arts, 505 W. McDermott. 1st class free. For more info: 469.854.6872 or Facebook.com/ TrueBlueDanceCrew. Allen Early Childhood PTA, support for parents and caregivers of kids age 0-5. Fun activities. Play groups, park days, lunch w/friends, field trips, Mom’s Night Out, Dads & Kids, etc. For more info: www.aecpta.com or information@aecpta.com. Allen/McKinney Area Mothers of Multiples, new and expectant moms’ forum, meets third Thursday each month, 7 pm, First Christian Church, 1800 W. Hunt, McKinney. For more info: www.amamom.org or 972.260.9330. Collin County Early Childhood PTA, meets second Monday each month, 9:45 am, Parkway Hills Baptist Church, 2700 Dallas Pkwy., Plano. Nursery res. req. For more info: Suzanne Judkins, 972.712.3634. MOMS Club of Allen, for moms and children in Allen, Fairview and Lucas. Monthly playgroups, kid field trips, business tours, special events, Mom’s Night Out and more. For more info: momsclubofallentx@gmail.com. MOMS Club McKinney Central, support group for stay-athome moms. Play groups, daytime activities, Mom’s Night Out, parties, babysitting co-op, etc. For more info: MckinneyMoms@yahoo.com. MOPS (Mothers of Preschoolers), support group for moms with kids 0-5 years, meets every other Friday, 9:30-11:45 am, First Baptist Church, Allen. Childcare provided. For more info: 972.727.8241. MOPS of Hope Plano, Hope Community Church, meets the 1st and 3rd Wednesday each month, 9:30-11:30 am, 3405 Custer, #200, Plano. For more info: 214.762.0037. Walking by Faith, offers prayer and practical support for mothers of children with special needs. Meets third Wednesday of each month (during the school year), at 6 pm, First Baptist Church Allen, 201 E. McDermott, Rm B214. Childcare is provided with advance reservations. For more info: Stacie Smith, staciesmithslp@gmail.com. MUSEUMS/PRESERVES ALLEN HERITAGE GUILD MUSEUM Open 2nd and 4th Saturdays, 10 am-2 pm, 100 E. Main Street, Allen. Permanent and rotating exhibits, historic photo collages and DVD programs on Allen history. For more info: www.allenheritageguild.org. CONNEMARA MEADOW PRESERVE Bird Walk at the Connemara Meadow Preserve, monthly alternating first Saturday and the first Sunday, 8-10 am, Allen. Bring binoculars and field guides; learn habits, calls and characteristics from Gailon and Rodney, Prairie & Timbers Audubon Society. All ages. For more info: www.connemaraconservancy.org. HEARD MUSEUM Saturday Bird Walk Educational Program, 8 am. Learn more about birding! These walks are intended to help beginning and intermediate birders with bird spotting and identification techniques. Blackland Prairie Chapter of Texas Master Naturalists, meets the second Tuesday each month, 7-9 pm, Heard Museum, 1 Nature Place, McKinney. Visitors welcome. For more info: www.bptmn.org or email info@bptmn.org. Heard Museum Collin County Hobby Beekeepers, meets second Monday each month, 7 pm, Heard Craig Center, McKinney. For more info: 972.562.5566 or www.northtexasbeekeepers.org. Heard Museum Native Plant Society, meets the first Tuesday each month, 7:30 pm, 1 Nature Place, McKinney. For more info: 972.562.5566. Heard Museum Nature Photography Club, meets the second Saturday each month, 1:30 pm, Heard Museum, 1 Nature Place, McKinney. For more info: 972.562.5566. Heard Museum Prairie & Timbers Audubon Society, meets the fourth Tuesday each month, 7 pm, 1 Nature Place, McKinney. For more info: 972.562.5566. Third Saturday Nature Talks: Nature Journaling. Learn new ways to experience nature through nature journaling! An intro to journaling techniques thru hands-on activities. SENIORS Active Agers 55+ meets 2nd Saturday, 10 am, upstairs at Market Street in McKinney (Eldorado at Ridge). Pre-travel meeting monthly to plan activities from day trips, weekend getaways to fun local events providing the chance to experience new places, to meet new people, and the opportunity to make new lasting friendships. For more information contact Sharon at rettmeier@sbcglobal.net or Pat at PatVanDyke@sbcglobal.net. Allen Senior Citizens Luncheon, meets second Tuesday each month, 11:30 am, St. Jude Catholic Church, 1515 N. Greenville. For more info: 214.509.4820. Allen Seniors Genealogy Club, meets 4th Monday each month, 1 pm, Allen Seniors Center. Must be member of ASRC. For more info: www.asgconline.com. Classic 55+ Game Night, 1st and 3rd Friday each month, 6:30 pm, 1st Baptist Church Allen, 201 E. McDermott, Rm E104. Snacks, fellowship and games. For more info: 972.727.8241 or Eddie Huckabee at huckgolf@ hotmail.com. Singles Mingle 60+, meets first Monday each month at Delaney’s Irish Pub, 6150 Eldorado Parkway, McKinney. This group is to provide a social forum for men and women singles who are active, enjoy meeting new people and like getting together twice a month. We have various social activities throughout the month. For more info: For meeting information on the third Monday of the month at 5:30 pm, call Bill, 214.544.5835. Xtra Years of Zest Seniors Luncheon, meets the third Thursday each month, noon, First UMC Allen, 601 S. Greenville, Fellowship Hall. Lunch, fellowship, speakers and entertainers. For more info: jgarling@swbell.net. SERVICE ORGANIZATIONS ALLEN/FAIRVIEW CHAMBER OF COMMERCE Allen/Fairview Chamber of Commerce Eggs & Issues Breakfast meets quarterly at Hilton Garden Inn, 8 am. For more info: www.allenfairviewchamber.com. Allen/Fairview Chamber of Commerce MOB (Men of Business), meets 2nd Monday every other month, 11:30 am1 pm, Kelly’s at theVillage, Allen, for networking. $20 mem; $25 non-mems/general public. For more info: www.allenfairviewchamber.com. Allen/Fairview Chamber of Commerce Tuesday Morning Live networking breakfast, every Tuesday, 7:30 am, Fairview Town Center, 311 Town Place, Fairview (former location of Wyland’s Ocean Blue restaurant). $1 member/$5 non-members 1st visit free. For more info: www.allenfairviewchamber.com. Allen/Fairview Chamber of Commerce W.I.S.E. (Women in Support of Enterprise), meets 2nd Thursday every other month, 11:30 am. Location varies. Networking and discussion of women’s issues. $20 member/$25 guest. For more info: www.allenfairviewchamber.com. Allen/Fairview Chamber of Commerce Quarterly Luncheon, meets fourth Tuesday, 11:30 am-1 pm, Hilton Garden Inn, Allen. $20 member/$25 guest. For more info: www.allenfairviewchamber.com. Allen/Fairview Chamber of Commerce Young Professionals Breakfast, meets monthly at Rudy’s Country Store & Bar-B-Q, 1790 N. Central Expwy., Allen, 8 am. $15 members/$20 nonmembers. For more info: www.allenfairviewchamber.com. Allen High Noon Lions Club, meets second and fourth Thursday each month, 5th Street Pizza (inside Stacy Furniture), 111 Central Expwy. S. For more info: Peter Young, 972.849.4952. Allen Kiwanis Club, meets every Thursday, noon, Bonefish Grill, 190 E Stacy Rd #100. Visitors welcome. For more info: www.allenkiwanis.org. Allen Lions Club, meets first and third Tuesday each month, 7pm, Kelly’s at the Village, 190 E. Stacy Rd., #1204, Allen. For more info: Bob Schwerd, Secretary, 214.402.0982. Allen Masonic Lodge No. 1435, meets second Tuesday each month, 7:30 pm at 101 North Allen Drive. Dinner is served at 6:30 pm. For more info: www:allenlodge1435.org. Allen Rotary Club meets every Wednesday, noon, 1st United Methodist Church, 601 S. Greenville, Allen. For more info: www.allenrotary.org. Allen Sunrise Rotary Club, meets every Wednesday, 7 am, Warm Springs Hospital, 1001 Raintree Cir., Allen. For more info: 972.673.8221 or www.allensunriserotary.com. Assistance League® of Greater Collin County, meets third Wednesday, 10 am at Stonebriar County Club, Frisco. Guests welcome. For more info: www.algcc.org or call 972.769.2299. Daughters of the American Revolution, NSDAR, The General Bernardo de Galvez Chapter, meets third Tuesday each month. For more info:GenBernadoDeGalvez@gmail.com. Fairview Rotary Club, meets second and fourth Thursday each month, Stacy Rd, Fairview. For more info: 214.893.5360. FUMC Legal Aid Clinic meets second Thursday each month, 6-8 pm, First UMC, 601 S. Greenville Ave., Allen. Provides legal assistance for civil matters to low income individuals in partnership withLegal Aid of NW Texas. No reservation required. Food & fellowship provided. For more info: kim.klieger@gmail.com or www.lanwt.org. Knights of Columbus, meets third Thursday each month, 7:30 pm, St. Jude Catholic Church, 1515 N. Greenville, Allen. For more info: Steve Nagy, 469.569.3357 or www.stjudekofc.org. Knights of Columbus Council 13044 meets fourth Thursday each month, 7:30 pm, Our Lady of Angels, 1914 Ridgeview Drive, Allen. For more information contact Jason at jason.beckett.1@gmail.com, or visit us at https://kofcknights.org/CouncilSite/?CNO=13044. Sons of Confederate Veterans, William H. L. Wells Camp, No. 1588, meets the second Monday each month, 7 pm, Tino’s Too Restaurant, 2205 Ave. K, Plano. Speakers, programs, etc. Open to anyone interested. For more info: Lloyd Campbell, 972.442.5982. VFW “Lone Star Post 2150,” meets second Monday each month, 1710 N. Church St, McKinney. Post Members, 6:30 pm; Ladies Auxiliary at 5:45 pm; Men’s Auxiliary at 6:30 pm. For more info: 972.542.9119, gmlsp2150@gmail.com or visit on web: www.vfwpost2150.org. VFW “Lone Star Post 2150” Motorcycle Group 33, meets first Saturday each month, 10 am, 1710 N. Church St., McKinney. For more info: “Driveway John” 971.822.4483, gmlsp2150@ gmail.com or visit www.vfwpost2150.org. VFW Post 2195, meets second Wednesday each month, 7:30 pm, Cottonwood Creek Baptist Church, 1015 Hwy. 121, Allen. For more info: Larry Nordgaard, 972.727.9956 or www.vfw2195. org. Vrooman’s Regiment, Children of the American Revolution, teaches children to serve their community, meets second Saturday each month. For more info: 972.396.8010. Please keep us informed of any local activities or events of general interest to our readers by fax to the Allen Image at 972.396.0807 or email to contact@allenimage.com. counsels, adult inmates on an as-needed basis when requested by the Diocese or a family member. Serving at Christ the Servant Lutheran Church in Allen since 2006, Pastor Gordon Illausky is passionate about preaching Godâ&#x20AC;&#x2122;s Word and the Sacraments of the Church. Over the years he has provided pastoral care in a number of crisis situations. Also a talented musician, he is a vocalist and pianist who has performed in multiple theater, operatic and musical venues. Pastor Illausky holds a Masterâ&#x20AC;&#x2122;s of Divinity Degree from Andover Newton Theological Seminary and formerly served as chaplain for Boston City Hospital in Boston, Massachusetts. The library is located at 300 N. Allen Drive. Call 214.509.4911 for more information. v Tom Keener is the cultural arts manager with the Allen Public Library. several CDs, including The Best Thing, a collection of their most popular tunes, like “Bye Bye Love,” “The Most Beautiful Girl in the World” and “Sweet Georgia Brown.” The band’s CDs will be available at the concert. The Library is located at 300 N. Allen Drive. Call 214.509.4911 for more information. v Tom Keener is the cultural arts manager with the Allen Public Library. Celebrate the Library’s 50th Birthday The Allen Public Library’s Golden Anniversary celebration will be 2 p.m. Saturday, October 14. It will include a documentary on the history of the library from its humble beginnings on Main Street to its current 54,000-square-foot building at 300 N. Allen Drive. Produced by the library’s Cultural Arts Office, over three dozen interviews of citizen volunteers, including members of the Epsilon Sigma Alpha, Theta chapter, (sorority that founded the library), current and former staff members and patrons were conducted. Learn more about how their team effort nurtured the creation of the awardwinning library that has had its programs featured in every major newspaper in the United States and has been mentioned in all major local television stations and a host of print and electronic media. A reception will follow. Call 214.509.4911 for information. orders came in, and when downtown McKinney hosted its first annual “Tour de Coop”—a self-guided tour of chicken coops—Preston had quite a few coops featured on the tour. In addition to using stained glass windows in his coops, whenever possible he also uses salvaged lumber, antique windows and doors, vintage pulley systems to open hatches and any other unique fixtures he can find. Completely into the green lifestyle, he then built himself a garden with a greenhouse constructed with old barn windows and other reclaimed material. And again, his unique, old-world-style structures were soon in high demand. Before long, he’d been commissioned to build a variety of garden sheds, greenhouses and other outbuildings out of reclaimed wood, including the garden shed used in Patina Green’s kitchen garden on Virginia near downtown McKinney, and a miniature urban farm complete with raised beds, a chicken coop and a shed. like Justin who loves the mentality behind small space design and the inherent efficiency it requires. He found one to rebuild—outfitting it with a queen bed, Xbox, flat screen TV and a galley kitchen that opens from the rear hatch so you can cook from outside—and so far, he and his wife have taken it over ten thousand miles, from the Texas-Mexico border into Canada. When his son was born two years ago, he bought an airstream so the whole family could continue to travel during the summer, and rebuilt the interior with furniture, new paint, floors and lighting. “It’s that iconic American symbol,” he says with a smile, having just returned from two weeks in Colorado. In August, Justin Preston began the new school year with a new position—the art teacher at the newly opened Preston Elementary, which is named for his mom. He has big dreams and plans for his students that he looks forward to implementing, as well as for own unique brand of constructive art. “One day, I’d like to own a shop where I could sell whatever I felt like making,” says Preston, adding that the inventory would be ever-changing, evolving along with his inspiration and interests. “Some days you might come in and find farm tables, other days painted signs or lighting. Who knows?” v Deborah Dove is a freelance writer from Allen. Halloween Fun for Boys and Ghouls by Deborah DOVE Fright Fest at Six Flags over Texas 2201 Road to Six Flags, Arlington, 817.640.8900 or www.sixflags. com. Now through October 31 (visit website for weekend Fright Fest hours). Zombies and ghouls take over the park this Halloween, ready to “greet” you as you make your way through the park after dark. In addition to thrilling rides like Batman, Superman, the Evil Night SkyScreamer and the Toxic Shock Wave, there are plenty of special haunted attractions guaranteed to give you chills, including haunted houses, special scare zones and live shows. Dark Hour 701 Taylor Drive (corner of Central and Plano Parkway), Plano, 469.298.0556 or www.darkhourhauntedhouse.com. Now through Halloween it is open Friday-Saturday 7 pm-midnight, SundayThursday 7-10 pm and Halloween night 7-11 pm. One of the premier haunted houses in the area, Dark Hour has sets worthy of a Broadway production, professional actors, inhouse designed special effects and state-of-the-art technology that adds up to one terrifying experience (the good kind). New shows are produced monthly that build on the existing Witch of Coven theme. There’s even live entertainment while you wait in line. Preston Trail Farms (formerly the Big Orange Pumpkin Farm at a new location) 15102 TX-289, Gunter, 972.382.4995 or www.prestontrailfarms.com. Open Monday-Sunday 8 am-8 pm through November 22. There’s nothing scary about this pumpkin patch—just family fun and a “life on the farm” experience, from picking your own pumpkin straight from the field, hayrides, a petting zoo and a six-foot hay maze. Goosebumps the Musical Phantom of the Auditorium Dallas Children’s Theater, 5938 Skillman, Dallas, 214.740.0051 or www.dct.org. Now through October 29. Based on the bestselling book series by R.L. Stine, this musical is perfect for the Halloween season. Scooby Doo-style detective work meets Glee-style repartee in this show intended for ages 7 and up. Wear your costume and bring the whole family to this silly and slightly spooky musical adventure. pumpkin challenge.” There are also costume contests and campsite decorating contests each weekend, so don’t forget your costume and spookiest decorations. Add in the usual Jellystone family style fun—campfires, s’mores, hayrides, fishing, hiking, scavenger hunts, arts and crafts, sleeping under the stars and visits from Yogi Bear, and you have an unforgettable family weekend full of memories. Bach and Broomsticks Fall Festival Watters Creek, Allen or www.watterscreek.com/event. Saturday, October 21, noon-9 pm. Pick a pumpkin from the pumpkin patch to decorate, explore various musical instruments at the instrument petting zoo hosted by AISD orchestra and band and enjoy Halloween crafts, face painting and balloon art. There are free hayrides noon-4 pm (starting at the Village Green) and musical performances by children’s musical entertainer Joe McDermott of the Allen Philharmonic Winds, the Allen Community Jazz Band and Rockestra!, an instrumental symphonic rock orchestra. Friscovania Toyota Stadium, 9200 World Cup Way, Frisco or www.visitfrisco. com/event/friscovania/1354/. October 21, 4-9 pm. Family fun awaits at the mayor’s designated safe trick-or-treat zone of Frisco. Activities include a kids haunted carnival, magic show, bounce houses, costume contest, food trucks, a virtual haunted hay maze, wicked runway show, photo ops, art alley, live music by the Mad Mexicans and a performance by Johnny Hayes from The Voice season 12. Tickets are $10 per person. Halloween at the Heard 1 Nature Place, McKinney, 972.562.5566 or www.heardmusuem. org/halloween. October 21, 6-10 pm. Kids can safely trick-or-treat along the eerie Dinosaurs Alive! Live-Size Animatronic Dinosaur Trail (with candy stops at each of the ten animatronic dinosaurs), enjoy fun activities and games, explore the museum, visit the “ghost town” and “haunted forest” and watch a family-friendly movie on the Heard’s outdoor amphitheater stage. There will be a costume contest for kids 12 and under and photo ops with the T-Rex. Concessions are available for purchase. Tickets are $15 for adults and $10 for kids 3-12. This event usually sells out, so purchase early! people understand the world around them and take part in making their communities better—as an associate professor for Collin College. Friends and family told her she was crazy to step away from a career in government, but O’Neil now calls teaching the second half of her life. “When I decided to transition from working for government, I knew I still wanted to be involved in some way other than as an employee,” O’Neil said. “I still believe in what our governments stand for but knew I would, and could, be more influential and effective working on the outside. Teaching for Collin College allows me to share my knowledge. I am able to influence students to become more aware of opportunities to get involved in government, whether that’s as an employee, an engaged citizen or a politician.” O’Neil, who was awarded Collin College’s Associate Professor of the Year in August, is just one example of the many professionals from other fields who have decided to share their real-world experience with students at the college. Collin College counts active-duty police and firefighters among its public safety academy instructors, and all its art instructors are active artists. Less well-known outside of the college is the number of professors who bring extensive experience in government or corporate environments to the classroom. Steve Saunders, an associate professor of nutrition at the college, brings both. Saunders graduated with a PhD in pharmacology and an area of expertise in toxicology, then worked for four years at the Environmental Protection Agency (EPA) before moving to the private sector, where he rose through the ranks to become vice president of food safety and nutrition at Frito-Lay. Saunders spent 16 years with the multinational company, overseeing food safety at about 40 plants, traveling the world much of that time. Most of us have had to deal with debt at some point in our lives, yet it still seems to be one of those taboo subjects no one wants to talk about— whether with friends, family or significant other. All the while, it may be more common for couples today to enter into relationships with debt from student loans, credit cards or loans for large purchases like cars or homes. Whatever each party’s situation may be, being up front early on can help you avoid unnecessary financial and personal conflict down the road. There are many cases when working with clients during financial planning meetings that advisors find that they don’t share information on certain financial matters for various reasons. transactions from each other. One in five Americans in a relationship say they have spent $500 or more and not told their partner, and six percent maintain secret accounts or credit cards, according to a poll conducted for CreditCards.com. This is why financial stress is one of the leading causes of divorce in this country. Wealth is a highly personal matter, touching all facets of our lives, so it’s not hard to understand why differences could hurt a relationship. Establishing an open line of communication when it comes to managing wealth is important, not only for your financial well-being, but for your relationship, too. could lead to a variety of complications down the road, including bad credit, trouble getting a loan or a less-than-ideal retirement. Beyond being forthcoming about your financial standing, it’s also worth noting that most of us have different ideas of what is normal or acceptable in terms of how we manage our finances and debt. Or, we have different outlooks on what the future should hold. For example, while one partner may be comfortable renting an apartment for several years, another may be eager to become a homeowner. If one of you is carrying a lot of credit card or other debt, it could be more difficult to get a loan for such a purchase. Better Together The good thing about having a partner who is on the same page financially is that you benefit from a support system and accountability partner. Just as many people have a gym buddy to help encourage them to stick with an exercise regimen, having someone who understands your financial goals—and weaknesses—can help you stay on your path toward a bright financial future. Remember to make time to have those difficult financial conversations. In doing so, you and your spouse or significant other are better off. v Steven Dawson is an Allen resident, a CFP™, educator, national speaker and president of Dawson Private Wealth. L to R: Mayor Gentry Jones, Ruth Pringle, Terry Berndt and Barbara Shelgren. With a welldeserved reputation for innovation, education and entertainment, the Allen Public Library owes its humble beginnings fifty years ago to a group of indomitable women. airview resident Dawn Brucher may have missed her calling in life. The woman with a degree in business who works part time for Court Appointed Special Advocates of Collin County (CASA) definitely has an eye for decorating and a flair for interior design. After hiring an interior designer to help her update her formal living area before an anniversary party for her parents, Dawn decided to tackle the rest of the house herself. The result is a refreshing mix of light, airy neutrals and clean lines with a touch of vintage charm. I knew I wanted clean and fresh, but with some warmth and hominess. on either side with white marble tile flecked with gray all the way to the ceiling. On the other side of the fireplace is the couple’s bathroom, which they completely gutted to make way for a luxurious new bath area. A soaker tub replaced the old whirlpool garden tub. They completely redid the shower, taking out a triangular seat to make more room, and tearing out the old frosted glass and replacing it with clear. Marble flooring and glass tile on the walls completed the new shower. They elected to keep the original wood cabinets for warmth. “Wood is hard to bring into a bathroom,” Dawn observes. On the wall across from the sink, Dawn hung twin old glass windows, complete with rope pulls and the original hardware. “I love that it’s a piece of someone’s house,” she says. Now that Dawn has tapped into her decorating mojo, she’s looking forward to redoing a home in historic McKinney in a few years when the couple’s kids are grown. There’s just one thing she’d do different. “I don’t want to live in the middle of it again!” Dawn says emphatically. “The worst was the cabinets. They sanded for weeks! Next time, we’ll do the work before we move it.” v Deborah Dove is a freelance writer from Allen. Photos: John Nervig Photography.